With the national road race jersies already allocated, tonight will see the crowning of the 2011 National Circuit Champion in Beverley, East Yorkshire. 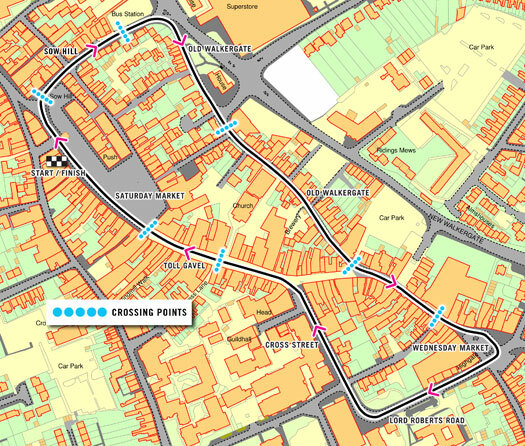 This evening’s race takes place over a 1.25km circuit thorough Beverley town centre, and will last one hour ten minutes plus five laps. This season’s criterium racing has seen Rapha-Condor-Sharp dominant in both the Tour Series and the National Circuit Series. They wrapped up the first five of the Tour Series events, and they have won all four of the first National Circuit Series races so far. Rapha-Condor-Sharp may have had the better of their rivals so far this year, but that won’t cause them to approach this evening’s contest with any complacenty according to Ed Clancy. Any one of twenty contenders can win this year’s National Circuit Championships, the defending champion has told Cycling Weekly. Clancy singled out Ian Bibby (Motorpoint), Johnny McEvoy (Motorpoint), Scott Thwaites (Endura) and Ian Wilkinson (Endura) as the danger-men in the event as far as he and Rapha-Condor-Sharp are concerned. Ed Clancy is the defending champion, winning last year’s event in a bunch sprint. It was a dramatic race, with a crash in the breakaway bringing down the race leaders on the last lap, and allowing the peloton to catch them with metres to go.